Who will have the most turnouts? my bet is on BETO. Beto will hold an anti wall march as tRump holds his campaign Talley. I watched Beto during the Senate race and was very impressed. Not sure if he'll run for President, but I like his style. He can do a lot for this country even if he doesn't run. I am hoping that one of the news stations will be reporting on this. It should be very interesting if Beto gets a larger crowd. There will be serious tweeting in the middle of the night if he does. Has the orange outrage come up with a nickname for Beto yet? I think Beto would be a great VP to pair with Biden for President. That'd give the experience needed and provide extensive guidance - shepherding if you will - to someone from the younger generations who will be leading this country in the years ahead wrapped up into one national election ticket! Robert's clam bake. Be sure and check out the live chat remarks! Put in your earplugs when he walks out! Someone can take a count at both events, reliably. I'm more interested in what Beto has to say. catkin, are you thinking anyone is clicking on your links? Her links don’t say anything anyway. Someone thinks they're holding court on this thread. It's a little amusing. Can't add much, watching the president's speech! Live look at the empty ground at Robert's clam bake. Catkin, are you aware that the black t-shirt that the man is wearing in your photo has an obscenity in Spanish? Might be best to remove the obscenity from this thread. catkin, thanks for the links to Beto's event. I expected to see a lot more people given all the hype. Fire dept said there were 6,500 people inside the Coliseum at Bonespur's rally. 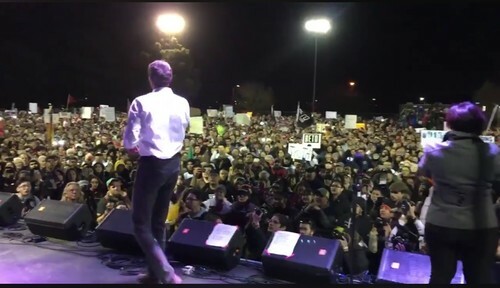 While at Beto's rally there were 10,000-15,000 people. Beto stands out among the crowd of candidates with his youthful energy and charisma. He's the one to watch. That's the inside capacity, lol. He stands out, alright. Like when he live streamed his teeth cleaning, disgusting. Lol. Running a campaign from a dentist chair for real? Yup. He can give O-C a run for her money with those big choppers. Are we seriously going to go after someone for their teeth?? Who cares if they have big bright and shiny teeth, small pointy teeth, fangs (like a cat :P) or no teeth at all?? This thread is a hoot with the right's "my dad can beat up your dad" nonsense. Who thinks it's a good idea to live stream their teeth cleaning? Again, disgusting. Did he skateboard onto the stage tonight while his hired mariachi band playing? 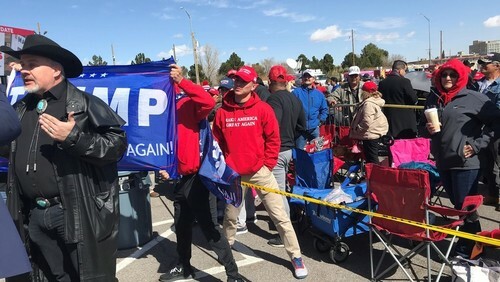 Just a fraction of the overflow at President Trump's El Paso rally tonight. They were "fenced in" at Trump's as well. oooooo those harsh rebukes from the frw! Stinging!! Skateboarding is unpresidential, huh? LOL!! I love how right is showing their insecurity with all the memes. Wait until they see Trump frog-marched off to prison. I like Beto but IMHO, he is not the most experienced or electable Dem. candidate. I also think the optics of a young guy debating a man old enough to be his father is not ideal. That is just my opinion as someone who is older and values the wisdom of age and relevant experience more than others might. If the older man in question has trouble with facts and his age has made him no less of a bankruptcy-favoring not-so-smart-risk-taking will try to bs-his-way-through-anything type of person, are the optics any better? Or worse? I am commenting only on optics but that is enormously important in politics..Consider tRump's (arguably presidential) appearance at his rally vs. Beto in wrinkled shirt and jeans, pacing back and forth and bobbing up and down as he spoke yesterday. I thought Beto looked like a college student at a pep rally. I fear it is not his time yet and that by running he may only damage future opportunities to hold office. Beto was right to make it about what it's like on the ground for the people of El Paso and that it was the opportunity to show that no matter which party one belongs to, people can come together. He's got an unconventional style and yes I think that he'd be a better VP running with a presidential candidate with experience and appeal to a wider range of voters - but his appearance in El Paso was truly about the people of Texas. Even Cruz's people gave him credit on that one, but I suppose it's easy to do that when you've won a midterm against the guy? Who knows. But the older politicians in DC are running against time, we've got a massive surge in the young demographic and it's only a matter of time before we see the wave(s) rolling in and beginning to take control of the way this country runs, who runs it...They may not have bought a house of their own yet, but they vote and they typically take distinct positions on the issues that drive their parents and Gen-x'ers bonkers over the practical details. "Free college for all" - HOW WILL WE PAY FOR THAT?! Eventually they'll have to adapt their idea or find a way to do it, it should be very interesting to see, that's for certain. I am commenting only on optics but that is enormously important in politics.. I agree. Beto reminds me of the young, inexperienced Obama, who easily surged pass Ms. Clinton ( with all that experiences and a vast campaign machinery, and certain negative baggage). Obama won his Statewide elections and held a seat in the US Senate . Barack was one of the only candidates who was against the Iraq invasion. Welcome, Tattoo Betty. Always nice to see a new reasonable person here. Illinois is also very blue. Beto getting so close in red, red Texas is pretty amazing. I do think he needs more experience though. A VP slot would be good. Obama was not in a position to vote on the Iraq war. While he said he was against it when not in office,as a senator he always voted for extensions and more funding. He also worked as president to keep us in Iraq. There was big difference between what Obama said and what he did. If he had been in the senate at the time, looking at his record, he would most likely have voted for it. He never took difficult positions with his actions. He never took difficult positions with his actions. Ask Ghadaffi or Osama Bin Laden about that. I am not trying to defend Obama though, but would do that if you want to open a new thread. Suffice it to say that Barack was a constitutional law professor and an Illinois State Senator and a United State Senator. The comparison with Beto does not hold water. Beto is not going to be the nominee of the Democratic party in 2020. It's not going to be easy to beat Trump. No one hit wonders or single issue candidates. It will take an intelligent, strong debater who has knowledge and experience on a broad range of issues... i.e., Biden Warren, Harris, Klobuchar, Sherrod Brown, Gillibrand. cat :P) or no teeth at all?? In my travel through rural low income area teeth were low on their priority list, I would think they would wonder why others have a mouth full of teeth. What they are not use to seeing would be funny to them. The rumor is Biden will announce and they're talking about a Biden /Beto ticket. what on earth do you think was difficult about that choice? No, he was an a senior lecturer, there's a huge difference. He did not write scholarly papers, he wasn't tenured, he only had to lecture. While the Law school allowed him to use the honorific term of "professor", his job title was "senior lecturer". Ah, yes you are trying to defend Obama, whose first appointments were Geithner and Summers. That told us all we needed to know about his priorities. Again posts are missing so I'll rewrite mine and see how long it lasts. Shades of the inauguration doctored photo when Obama had MILLIONS more at his 2008 than tRump did. tRump is so worried about size. His small hands, his small mushroom. He had 6500. Fire dept. won't let more in. He had crowds outside as well. Beto had 10-15,000 according to police. None of the people on HT were there. They just take every lie outta the moron's mouth as fact. tRump is known thru out the world. Beto is only known to Texas people as well as political junkies. Lily, I just read the same on NPR. "Trump seemed especially attuned to and plenty sensitive about the split-screen image of the rally O'Rourke, El Paso's former congressman, was holding outside in the heavily Democratic city. Exaggerating, as he's prone to do, about his crowd size, Trump claimed that O'Rourke had only drawn 200 or 300 to his protest while they had 35,000 people trying to get into his. According to NBC News, O'Rourke's team said there were about 7,000 people at his rally and mile-long march beforehand, per law enforcement. 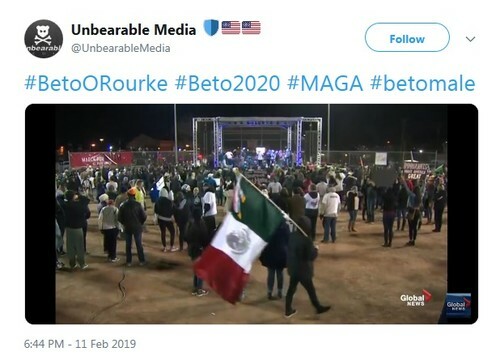 And Bloomberg News reportedthat O'Rourke's rally had been estimated at 10,000 to 15,000, according to local police. At various points during his own rally, Trump claimed that 69,000 people had RSVP'd and that fire marshals allowed 10,000 people in with "tens of thousands" still watching outside. 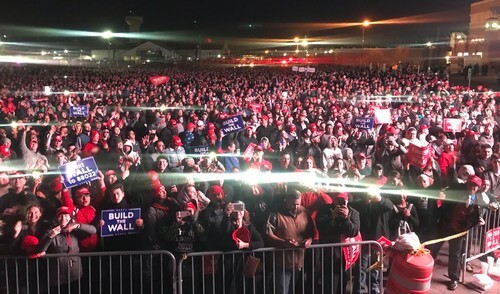 But NBC News reported that Trump's rally was at its 6,500 capacity with 10,000 to 12,000 watching outside or in overflow areas, per the local police and fire departments." That would be jealousy. It frequently rears its ugly head around here. 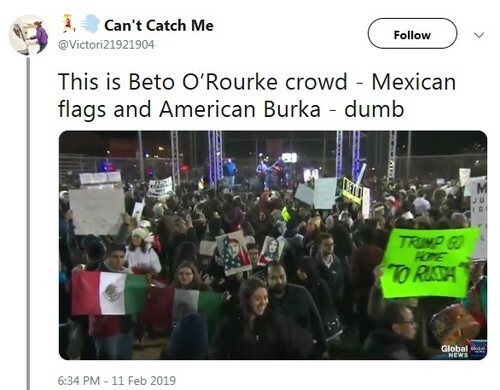 No matter how trump supporters try and spin it, Beto's crowd outnumbered trumps. Oh Elvis, you are so beyond the crowd! Hypocrisy at it's most obvious, especially criticizing those who noted Beto's gross prophylaxis he self published while almost daily calling President Trump cheetohead, 0range man, tiny hands, straw hair, etc. Really? Playing offense so hard without considering defense can expose weak cognitive skills. At least we know Beto has clean teeth? Nobody has to watch something or someone that they don't like or want to watch - if teeth cleaning bothers you then don't watch it. Don't worry--I didn't finish watching it. It is difficult to identify with a politician that has presidential aspirations thinking that voters would be interested in watching a self video of his mouth being cleaned. I suppose there are people that are enthralled with such personal, mundane activities, after all that's what our society has come to. Sound bites over substance, it got Barack Obama elected twice and school children chanting songs to their "dear leader." 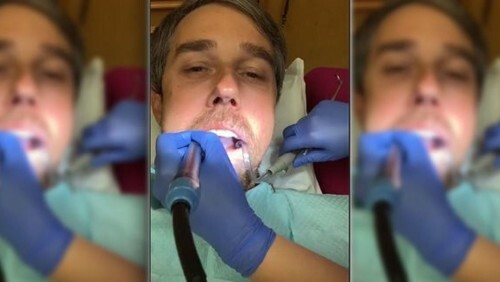 Once again the point about Beto’s visit to the dentist is being missed, conveniently ignored. The dental hygienist, who is an immigrant, was the point. So tRump blatantly lied and said the fire department allowed him to have 10,000 people in even though it was over the limit. Then he said he had 35,000 and poor little Beto had two or three hundred. Sad. Turns out Beto had at least 10,000 and that's probably what tRump had... counting inside and outside. The pathetic liar. And the cretins in their MAGA caps screamed tRump, tRump,tRump and build the wall , build the wall, when the maggot in the cap attacked and roughed up the BBC journalist. The crowd loved it. The BBC wants it investigated. How any NORMAL person finds this acceptable. A sincere thanks to Mitch!